All photos courtesy Travel Alberta unless otherwise stated. This is a great drive if you are planning a trip with a motorhome and want a little adventure and a little history. Canadream has come up with THE GRAND ADVENTURE or as I like to call it THE 12-DAY HERITAGE MOUNTAIN TOUR. You can modify the trip as you like. Perhaps you would like to spend more time in a particular area because you like the scenery or the history. It is all up to you. I have included some photos so you can visualize what to expect. Remember, it is your holiday. Take the time to decide what you would like to see and do to make it memorable. If you have chosen to rent a CanaDream RV, please phone the CanaDreamstation at 291-1000 to arrange the morning transfer from your hotel to the station. Detailed vehicle instruction will be provided. Do your grocery shopping and head out on the first section of the Grand Adventure - the northern section of the Cowboy Trail! 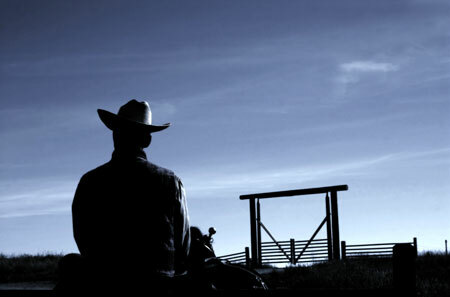 Officially, the 640-kilometre-long Cowboy Trail stretches the entire distance of Highway 22 from Mayerthorpe (northwest of Edmonton) south to Pincher Creek. It then jogs south on Highway 6 and east on Highway 5, ending in Cardston, a nudge above Montana, USA. You'll see cowboys ropin' cattle, experience small town rodeos, country fairs and rich ranchland where quarter horses still reign. The proximity to the Rockies means you'll also witness a great diversity in wildlife and scenery. From deer and elk to numerous small town rodeos - The Cowboy Trail section of The Grand Adventure is full of geographic and historic gems. If you're in Calgary in early July, treat yourself to the Calgary Stampede and kick up your heels at the 10-day whoop-up, known as "The Greatest Outdoor Show on Earth". Getting started you will head north from Calgary to Sundre, which is a good jumping-off point for wilderness trips or horseback ventures into the Rocky Mountain Forest Reserve. Or, just poke around Sundre's Pioneer Museum. From here, you'll continue north to Rocky Mountain House to discover a superb National Historic Site where the story of Canada's fur trade and rugged voyageur life is re-enacted. For a different perspective take a Voyageur Canoe trip down the North Saskatchewan River. So wild is this forested area that when you spot the teepees and smell the smoke from the site's camp, you'll be spirited back 200 years when the trading post was first built. Following the eastern flanks of the foothills, you will continue up Highway 22 to Mayerthorpe and pitch your camp at this northern terminus of the Cowboy Trail. Leaving Mayerthorpe, you will continue to see countryside that is ideal for anglers, nature lovers, big game hunters, and those who want to explore the wilderness. Bear, deer, moose, mountain sheep and wapiti are found throughout the region. Hunters regard this as one of the finest big game areas in the world, and, in particular, flock to Edson and Hinton in the autumn. Within easy reach of these towns are abandoned mines-ghostly reminders of the heyday of the "Coal Branch". This once thriving area of coal-mining towns prospered from 1910 to the 1930s, was revived during the Second World War, but slumped again in the late 1940s, when the railways introduced diesel-powered engines. Edson was created by the Grand Trunk Pacific Railway in 1910, when it built a branch line from here into the coal-rich area to the south. In its heyday Edson was promoted as "Gateway to the Last Great West". Today, although most of the branch installations are gone, Edson is still an important stop on the CN line. Summer events here include a rodeo and a two-day sidewalk jamboree featuring street dancing, bands, auctions, and art and craft displays. Just south of Edson is the McLeod River . This clear, cold river, fed by melting snow and rain, abounds with Rocky Mountain whitefish, Dolly Varden, eastern brook trout, walleye, northern pike and arctic grayling. Continuing along Highway 16, you will come to Hinton. Hikers and horseback riders can explore a 20-kilometre restored section of the Bighorn Trail, an early pack trail that extended some 140 kilometres along the Bighorn Ridge between Hinton and Nordegg. There are two wilderness campsites on the trail. About 1,000 wild horses, descendants of once-enormous herds, roam near Hinton in the wooded foothills of the Rockies. Relentlessly rounded up, first by cowboys, then by hunters to supply pet-food manufacturers, wild horses have all but disappeared from the Canadian West. About 7 kilometres (4 miles) past Hinton, you can turn North on Highway 40 for about 22 kilometres (13 miles) and reach William A Switzer Provincial Park. Five lakes, linked by Jarvis Creek, provide more than 30 kilometres of canoeing through this park in the foothills of the Rockies. 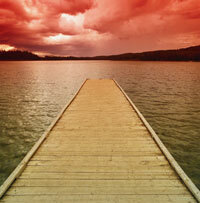 One, called Graveyard Lake, gets its name from a nearby Indian burial ground. Wildlife is abundant here. Moose, wapiti, lynx, coyotes, deer, marten, fisher, muskrat and beaver as well as owls, woodpeckers, loons and eagles inhabit the woods and waterways. A lush forest of lodgepole pine, white and black spruce, balsam poplar and trembling aspen supports a thick underbrush of saskatoon, cranberry, wild rose and juniper bushes. Harebell, lily-of-the-valley, fireweed and indian paintbrush blossom throughout spring and summer. At Alberta Blue Lake Center in the park, you can study archery, canoe construction, bush survival, natural history, rock climbing, snowshoeing, sailing and fishing. The center was established in 1971 by the provincial government to develop public interest in the outdoors and to train recreation leaders for community agencies and educational institutions. 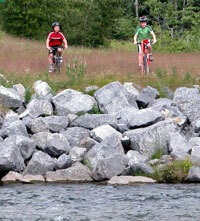 In close proximity to the William A. Switzer Provincial Park is the 4,597-square-kilometre Willmore Wilderness Park. Visitors can hike or canoe for a few days (or a few weeks) without meeting or seeing another person. There are no permanent residents and, except for a few Forest Service cabins and some fire lookouts, no buildings in this wilderness. Automobiles are prohibited. Local commercial outfitters take families horseback riding along trails in summer, and guide hunters in the fall. 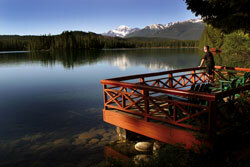 Returning to Highway 16, you will continue on to Jasper National Park and the town of Jasper. Jasper National Park is a sweeping expanse of scenic beauty - of awesome mountain peaks and centuries-old glacial ice, of flower-carpeted meadows and mirror-like lakes. In the early 1800s the need for a fur-trade route across the Continental Divide brought the first white men to this alpine wilderness. Three log buildings were built for weary voyageurs traveling over the Yellowhead and Athabasca passes. The ramshackle settlement was named Jasper House after North West Company clerk Jasper Hawes. In 1907 the coming of the railway through Yellowhead Pass prompted the federal government to preserve the area as a national park. Today, the park covers more than 10,800 square kilometres, of which only 800 square kilometres are flat valley bottoms. Grassy meadows carpet the lower slopes, where rainfall is scant. Higher up, a moister climate has produced bands of forest on the mountain flanks. Above the timberline, about 2,100 metres, a sub-arctic climate stunts even tenacious alpine vegetation. Mule deer graze among the poplar and jack pine stands of the Miette and Athabasca valleys. Bighorn sheep share their lofty range with mountain goats, but are left far behind when the goats climb to narrow ledges shared only with eagles. Rarest of all sights in the park is the mountain caribou herd that ranges by the headwaters of Maligne Lake. In the 1800's, the townsite of Jasper was was a way station for wilderness travelers - trappers, missionaries, geologists, surveyors, naturalists and prospectors. 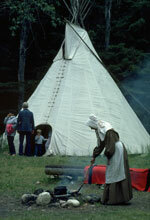 The first facility for park visitors was established in 1915 in the form of a tent camp on Lac Beauvert. Today the town is a year-round recreation center with facilities ranging from the primitive to the plush. Located near the confluence of the Athabasca and Miette rivers, Old Fort Point is the site of Henry's House (1811), an early fur-trade post. Nearby grassy slopes are a grazing area for mule deer. Pyramid Lake Drive winds for eight kilometres north to 2,722-metre Pyramid Mountain and a pair of sparkling glacial lakes. Haida Indians of the Queen Charlotte Islands carved the totem pole outside the railway station. A cairn near the mouth of the Rocky River commemorates Jasper House, built by the North West Company in 1813 and run by Jasper Hawes. The 230-kilometre Icefields Parkway ranks among the great highroads of the world and commands some of the most majestic scenery in the Canadian Rockies. It runs between Jasper townsite and Lake Louise, following in turn the Bow, Mistaya, North Saskatchewan, Sunwapta and Athabasca rivers, crossing the Bow and Sunwapta passes and presenting a panorama of peaks, glaciers, waterfalls and canyons. Some landmarks bear the names of early guides and explorers - Wilcox, Stanley, Nigel; others have descriptive names such as Tangle Ridge and Whirlpool River, or Indian names such as Sunwapta (turbulent river). Click here to find a more indepth driving tour of the Icefields Parkway. Once part of the vast ice sheet that covered most of Canada for more than a million years, the Columbia Icefield is the largest accumulation of ice in the Rocky Mountains. It blankets an area of nearly 300 square kilometres to depths of 900 metres. The most accessible of the many glaciers that jut from the main body of the icefield is the Athabasca Glacier, which can be reached from the Icefields Parkway. Tours on the Athabasca Glacier give visitors a close look at mill holes (deep, circular depressions) and crevasses (long, nearly vertical fissures). Look for bighorn sheep and goats at Tangle Falls , Stutfield Glacier Viewpoint and Goat Lookout. Stutfield Glacier Viewpoint offers a view of the Sunwapta River , an excellent example of a braided river. The valley bottom is filled with sand and gravel spreading the river across the valley floor in interlacing channels. The Stutfield Glacier features a picturesque pair of ice falls, which spill down the face of Mt. Stutfield . Take the 1 km (1/2 mile) access road from the Icefields Parkway to Sunwapta Falls and Canyon and see where the Sunwapta River changes its course abruptly from northwest to southwest, then plummets into a deep canyon producing the spectacular Athabasca waterfall. Quartzite boulders litter both sides of the Icefields Parkway where rockslides have swept down here from the mountain slopes to the east. Above the boulder field, near the top of the ridge, is a distinct pink scar where part of the rock sheared away. The Sunwapta River now breaks in rapids over the foot of the slide area. The rock itself has been used extensively as building stone in Jasper National Park . To the southeast of Poboktan Creek loom Tangle Ridge and the 3,315 metre Sunwapta Peak . In the opposite direction, Endless Chain Ridge stretches to the northwest. Just beyond this area is the Saskatchewan River Crossing, the junction of Highway 11. Take a short detour heading east and you'll discover fantastic tracts of wilderness noted for fishing, trail riding and hiking, such as the Wildland Recreation Area, White Goat Wilderness, Cline River and Abraham Lake. Keep your eyes peeled for Bow Summit, which at 2,068 m (6,785 ft.) above sea level, is the highest point on the parkway and offers one of the best mountain panoramas in the world at Peyto Lake viewpoint. Jasper and Banff National Parks border one another along the divide between the headwaters of the Sunwapta and North Saskatchewan rivers. Waters flowing north from this divide eventually reach the Arctic Ocean via the Mackenzie River, while those flowing south cross the Prairies via the Saskatchewan River to Hudson Bay . The Icefields Parkway crosses the divide at 2,035 metres above sea level. At this elevation snowbanks remain in sheltered areas throughout the summer. Like many high valleys near timberline, the bottomland near Sunwapta Pass is virtually treeless. The Icefield Parkway ends in the picturesque village of Lake Louise. Located in the Bow Valley , the village provides shopping, accommodation, meals, automotive services and tourist information. Four km (2.5 mi) above the village is the lake itself, dominated by the majestic Victoria Glacier. Near Lake Louise, visit emerald-coloured Moraine Lake . Surrounded by a panorama of 10 glaciated summits, the Wenkchemna Peaks , Moraine Lake is found at the base of the Continental Divide, the geographic point where all waters flow either west to the Pacific Ocean or east to the Atlantic Ocean. Continuing past Lake Louise, look for the turn-off to Castle Mountain. According to Indian legend, this 2,862 metre turreted peak is the home of the Chinook - a warm, dry winter wind that sweeps out of the Rockies to melt snow in the foothills and prairies. A hiking trail winds for eight kilometres from a warden station to Tower and Rockbound lakes, hidden in a hanging valley behind Castle Mountain. Another trail follows a fire road to a lookout high on the mountain's flank. 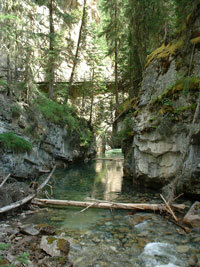 Next stop along the road is Johnston Canyon , which was carved out of the soft underlying rock by Johnston Creek. Among the canyon's wildlife is the dipper or water ouzel, a bird which lives at the very edge of turbulent mountain streams. In feeding, the dipper will wade, swim, dive, and even walk underwater on the streambed. In a meadow just beyond the canyon are a group of seven springs called the Ink Pots. Two of them are noted for their murky, blue-green color - a hue created by suspended sediments. To the west, open meadows mark the site of Silver City , a mining boom town. During its heyday (1883-85), the town boasted a population of 2,000, four general stores and several hotels. The mines failed to meet expectations, however, and a disputed claim helped to speed the town's demise. 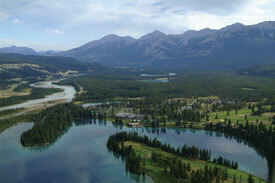 Proceeding up the highway, you will find a nine-kilometre drive that skirts the shores of the three Vermilion Lakes. 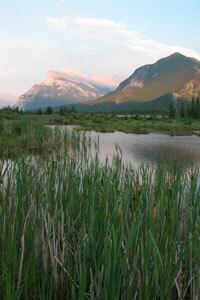 The surrounding wetland, a marshy area of the Bow River, is rich in plant and animal life. Sedges, rushes and swamp horsetail provide a habitat for beaver and muskrat. On slightly drier ground grow willows, black currants and bracted honeysuckle. Beyond the wetland are groves of white spruce sprinkled with poplars. Ringing the lakes are Sulphur Mountain, Mount Rundle and the peaks of the Sundance Range. This is the birthplace of Banff National Park. In the early days, bathers descended into the cave by means of a ladder through a hole in the cavern ceiling. Since then a tunnel has been burrowed into the chamber so that visitors can view the historic site. Inside the grotto, jagged rock walls arch above steaming Cave Pool, fed by sulphur springs flowing at 675 litres a minute. The Basin, seen here to the right, became a popular bathing spot as people flocked from around the world to experience the wonders of these warm waters. Today it is home to the Banff Springs Snail. 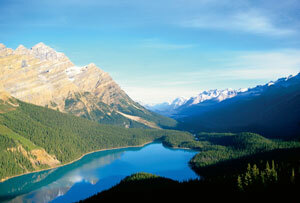 One of Banff's most popular attractions is the Banff Gondola which takes you up Sulphur Mountain. The gondolas rise 690 metres to the summit ridge (2,348 metres) and give you a sweeping panorama of mountains and valleys. Enjoy a meal as you gaze over the valley and Banff townsite. Take the self-guided interpretive walkway to Sanson’s Peak. The complex and observation decks are handicapped accessible. Next door at the Banff Upper Hot Springs, a mineral-rich, outdoor hot pool (47.3 °C) is open year-round for you to enjoy. The Whyte Museum, founded by Peter and Catharine Whyte, offers you a unique look at the history of Banff and surrounding mountain area in pictures. From the early photos of the outfitters, mountaineers and park visitors to contemporary exhibitions, this museum will take you back to the past and into the future to facinate you. 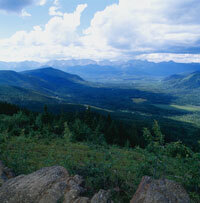 The Archives and Library is a comprehensive research center for the unique mountain regions of western Canada. Tours and programs are offered year-round. For a firsthand look at what it was like to live in Banff in the early years, take the Heritage Homes Tour and step into the home of Peter and Catharine Whyte as well as Philip and Pearl (Brewster) Moore. The Banff Park Museum, a national historic site, is a real treat for visitors and locals alike. The 1903 log structure is reminiscent of train stations as well as federal park buildings of the era. Inside, some specimens of wildlife native to Banff National Park have been displayed for over a century. From the smallest bird's egg to the famous mountain goats, from the Canadian symbol of the beaver to the bison, come and discover the animal world up close and learn about the area's early beginnings. Indian lore and customs are shown in dioramas at this museum built to resemble a 19th-century fur-trade post. Make sure to take in a guided tour of the museum which is offered to the general public. Dreamcatchers, jewellery and other unique native crafts make the perfect souvenir and are available at the museum gift shop. 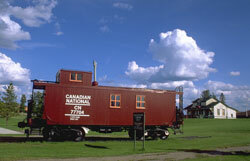 This museum is located along the beautiful Bow River, right across from Banff Central Park in the townsite of Banff. Once at Longview , explore area and search out the towns of Millarville (famous for its farmers market held on Saturdays throughout the summer), Turner Valley (it was here, in 1914, that Canada 's first major crude-oil discovery was made), Black Diamond and Longview . These towns are all part of Diamond Valley - the Heart of the Cowboy Trail. For an unusual diversion take a gas plant tour in Turner Valley . The tour tells the story of the area, once one of the most active oil and gas fields in the British Empire. Just south of Longview is another excellent interpretive centre, the Bar U Ranch, full of original buildings, ongoing archaeological digs and intriguing exhibits. From here, head south, bound for Pincher Creek - most noted for Kootenai Brown's Pioneer Village. Continue south on Highway 6 to Waterton Lakes National Park, full of charming B&Bs, lodges, hotels and natural mountain splendour. 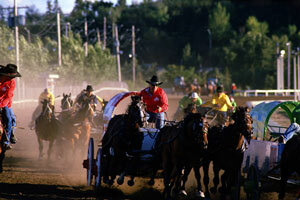 The Cowboy Trail ends at Cardston where the Remington-Alberta Carriage Centre is the No. 1 magnet. Housing one of North America 's largest collections of carriages, buggies and wagons, it's a spectacular example of another era...the Wild, Wild West. From Cardston, head north on Highway 3 to Fort Macleod , the first outpost established by the North West Mounted Police (later RCMP) in 1874. Today Fort Macleod 's top attractions include the downtown historic district, the province's oldest operating theatre (the Empress), the Fort Museum and the nearby UNESCO site of Head-Smashed-In Buffalo Jump. This is the largest, oldest and best preserved of all bison jumps in the world. Then turn north on Highway 2 en route to Calgary, where you can visit attractions like Heritage Park, the Calgary Zoo and the Glenbow Museum.